One of my mantras in book collecting is focus, focus, focus. The problem with living by this credo is that it leaves so many great books out of your collection. There are two books that have obsessed me like the white whale haunted Ahab: Charles Olson’s Maxiumus Poems 1-10 and 11-22 published by Jargon Society. I fell in love with them when I first saw a signed copy of the initial ten poems for sale by Lame Duck Books at a book fair. They are quite simply works of art. The books were published as Jargon 7 and Jargon 9 by Jonathan Williams. So I was saddened to hear that Jonathan Williams passed away at the age of 79. There have been numerous appreciations appearing on the internet and in print in the past few weeks. When I worked at Second Story Books, a copy of Mina Loy’s Lunar Baedeker published by Jargon Society came into the store. Like the Maximus Poems, the Lunar Baedeker was a beautiful object. This was the first time I came into contact with Loy’s work. Jargon Society specialized in just these types of introductions. Williams made a point of bringing before the public eye writers from the fringes and shadows. He published Louis Zukofsky, Kenneth Patchen, Lorine Niedecker, Bob Brown and Larry Eigner. All these writers are (or were), like Williams himself, unfairly neglected even by those with more adventurous tastes in the arts. Early on, Williams, due to his Black Mountain ties, championed Robert Creeley, Joel Oppenheimer and, most famously, Charles Olson. William Burroughs seemingly published everywhere during the mimeo revolution. Given Burroughs’ ubiquity, it is interesting to consider where Burroughs did not appear. The Cleveland of d.a. levy is one place, and the Jargon Society is another. Burroughs appeared in the legendary final issue of Black Mountain Review in 1957, a key appearance for Burroughs. So Burroughs has a tenuous link to the Black Mountain Scene and was aware of the College. Yet this link does not extend to Williams. Williams did not publish the Beats. He turned down Howl before City Lights decided to publish it after the Six Gallery Reading. Williams never felt bad about his decision. He reasoned that Howl would have only sold 300 copies if Jargon had published it. Williams did not ask for much in the way of readers. He was happy with 50 dedicated eyes and ears. Yet there are similarities between Jonathan Williams and Burroughs. Both men had privileged backgrounds; both had a sophisticated, aristocratic air about them; both were gay; both lived as expatriates in England; both were jacks-of-all-trades in all aspects of experimental literature and art. Yet I can not think of two writers more different in their personality, lifestyle, creative work, and literary concerns. I think we can get to the heart of some of those differences by comparing the two men’s relationship to England. For Burroughs, England was simultaneously an escape and a prison. In the mid-1950s, Burroughs went there seeking a cure to his addiction to heroin with the help of Dr. Yerbury Dent. The apomorphine treatment temporarily freed Burroughs from staring at his shoe in Tangier and allowed him to pour himself into the process of writing Naked Lunch. Yet Burroughs also viewed England as a straitjacket — too buttoned up with university tie fixed on too tight, the royal crown screwed on too tight. In a sense, he hated England. (I should stress that England for Burroughs was quite simply London. Anywhere else in the country was strictly Hicksville.) Clearly, Burroughs found even London boring: the pubs closed too early as did the subway and restaurants, but in the late summer of 1965, Burroughs saw signs of life in the old slag. Burroughs moved to London just as Swinging London exploded into the global consciousness. Beatles London, Pop London, the Albert Hall Reading London, Mary Quant London, Indica Bookshop London. This was England for Burroughs. He lived at St. Duke Street, St. James from 1966, residing near Anthony Balch and Brion Gysin. The ties to film and art are important. London at the time was the center of international popular culture in music, film, fashion, and art. It was an international center on par with Paris and New York. Such locales were Burroughs’ natural habitat. He was an urban creature, and his best work is urban in nature, even if his view of the city is not entirely positive. Burroughs’ literary landscape and his characters are generally urban: Interzone, the drug underworld, corporate bureaucracy run amok. The cut-up is the urban experience par excellence. Reading the landscape out of a rushing subway, the flood of images and text at Times Square, the polyglot gibberish of an international marketplace, scanning a newspaper over somebody’s shoulder at a street corner. Jonathan Williams’ England was a pastoral one. In 1969 (when Burroughs was living in London), Williams settled at Corn Close, a farmstead in the Pennine dales of northern England. Williams was led there by the work and suggestion of Basil Bunting, particularly Bunting’s poem Briggflatts that electrified many readers when it appeared out of the English North in 1966. If Burroughs’ England is Pop, surface, fast, glossy, schizophrenic, urban and international with an eye toward Paris / New York, Williams’ England is earthy, gnarly, slightly daft, Anglo-Saxon, tweedy and rural. Corn Close was the aristocratic country manor gone backwoods. Williams’ experimentalism comes not from the sophistication of the international avant-garde, but from the primitivism of folk art, the plain talk and homespun wisdom of the back roads. Williams’ disdained the urban. Williams stated, “Anyway, I have turned more and more away from the High Art of the city and settled for what I could unearth and respect in the tall grass.” Burroughs found his inspiration in the exact place that Williams turned his back on and closed his ears to. It could be argued that Burroughs’ final trilogy could only have been completed in a place like Lawrence. The pirate commune, the Wild West, the Western Lands. This is Burroughs’ pastoral vision: what Burroughs saw and felt as he shot guns in the countryside and sat on his porch with his cats away from the activity, pace and temptations of the City. The final trilogy are books of contemplation, meditation, eulogy. These books comprise Burroughs’ eclogue. The city books, Naked Lunch and the cut-up novels, are his Inferno, Purgatorio, and Paradiso, maps of Hell and with fleeting glimpses of Paradise. Late in their lives, Williams and Burroughs were the eccentric old men of American Letters, but they came by their eccentricity differently despite similar backgrounds. 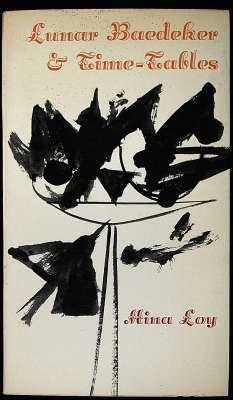 Both men were clearly at the forefront of the experimental art community of the post-WWII era. In a side note, this is the great triumph of Black Mountain College. Black Mountain incorporated both Williams and Burroughs into its creative vision. There was an international sophisticated experimentalism as well as a backwoods funkiness to the place that was unique in the 20th Century. By all accounts Williams was a true man of letters and a living library. In the next couple of weeks, I hope to get a hold of and read some of his books of poetry, but as of now, the Williams I know is Jonathan Williams the driving force behind Jargon Society. Robert Bank, RealityStudio’s European correspondent, knew Williams much more fully as a writer, publisher, and friend. Robert has gone through his files and scanned several photos, letters and images related to the Williams he knew: the Williams of Corn Close. Think of this England as opposed to Burroughs’ life in London from 1966-1973. I present Bank’s collage of images and text to give a glimpse into a giant of alternative publishing and creative life in the post-WWII era. View Robert Bank’s slideshow, Jonathan Williams in England. Written by Jed Birmingham and published by RealityStudio on 19 May 2008. 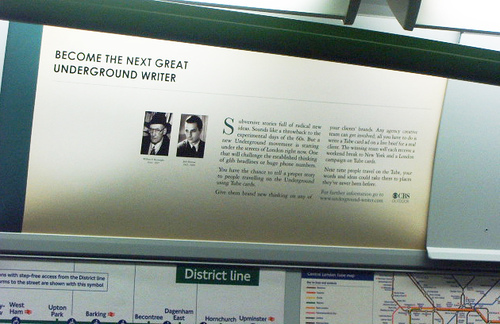 Photograph of “Art Not Ads” campaign poster featuring Burroughs and Kerouac taken from london-underground.blogspot.com, November 2007. I’m ashamed to say I’d never heard of Jonathan Williams before, so I found this very interesting. BUT the reason I write, re Burroughs and Sixties London, is that I’m looking for a quote where Burroughs says something like “London swings like a corpse on the end of a rope” (could be “body”, but something like that). I’m writing something on Burroughs and I’ve vaguely known this quote for years, since I was in my teens probably, but now I want it of course I can’t find it. It’s not in e.g. Burroughs Live, or in Morgan – it could just be in the fiction somewhere. Does anyone recognise it? I’d be really grateful if they do, and I’ll also put them in the acknowledgments when the time comes. Fe. Coincidentally, I have the two books you mentioned. He was a grand phenomenon, swifter than wind, and weightier than rock. I’ll share a story: Decades ago, when I first encountered the Jargon wonder, I was puzzled by the mention of the sponsor, Donald Anderson, Roswell, NM. Living then in Maryland, I’d hardly ever figured just where New Mexico was. Well, many years later, my 2nd late wife and I met Mr Anderson and his remarkable wife at a party at their extraordinary home in Roswell!